We specialise in residential house painting in Auckland and are proud to say that most of our work has been repeat trade from our satisfied customers, alongside word of mouth business from our customers’ friends and family. Whether you need interior or exterior painting our commitment to you, is to treat your house as if it were our own. We are Registered Master Painters and have won a number of awards for our house painting work. Using a Master Painter gives you the guarantee of quality and a job well done that comes with the certification. We have painted all types of Auckland houses – villas, bungalows, new builds, renovations, townhouses, flats and apartments. We pride ourselves on knowing the correct products to use including sealers, primers, undercoats, enamels and topcoats for your house. We will make sure that all painted surfaces are finished to a high standard of workmanship, achieving the correct and uniform thickness of paint, film build and gloss level. Whether you are looking for a complete repaint or a tidy up, Sensation Painters have you covered. Contact us for advice or a quote – we are always happy to help. Auckland houses come in many different shapes and sizes and are built from a variety of products. Whether your house is painted weatherboards, stained, plaster or clad we can help you refresh or fully restore your paintwork. Find out what makes us different. Read some of our testimonials. Sensation Painters have tradespeople who also hang wallpaper, feature wallpaper, lining paper and studio vinyl. We make sure the edges of the wallpaper are properly butted or spliced together. We accurately match patterned wallpaper and trim accordingly. We hang all wallpapers with a suitable adhesive to ensure the paper is hung correctly. Often there is work that needs to be done to prepare your property for painting. Some of these services we can provide ourselves, whilst others are provided by our trusted subcontractors who can make repairs, wash and plaster before the painting and decorating begins. Using our subcontractors can save you time and money ensuring you a smooth process and minimal disruption from start to finish. Plastering, glazing and small repairs – we can undertake small repairs to the exterior and interior of your home, window sashes and weatherboards before painting. We refer larger jobs to our plastering, glazing and building subcontractors who can skim your walls and undertake any necessary repairs. Exterior house wash – it is essential your house is cleaned in preparation for a re-paint. Our subcontractors do an excellent job and we are always happy with the results. Scaffolding – our subcontractors can provide scaffolding for your exterior and interior painting. We will build their cost into the price of your quote. 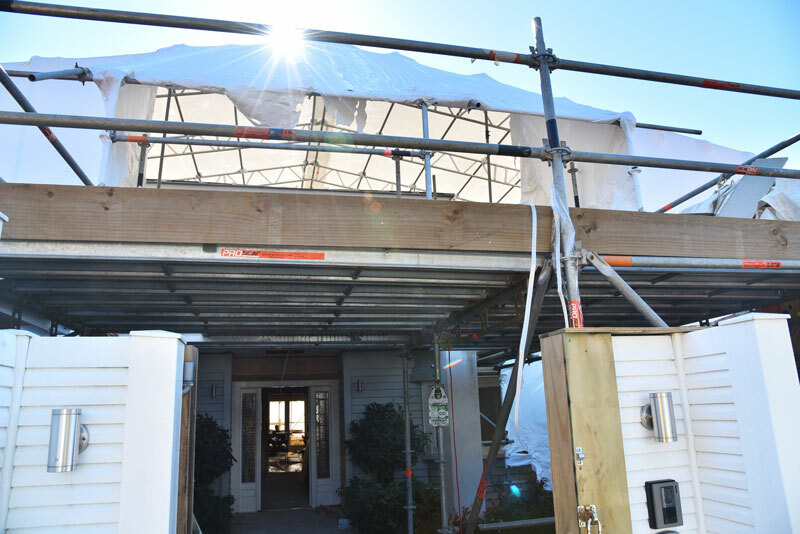 Scaffolding requirements must meet New Zealand health and safety standards.